The father of modern photography, William Henry Fox Talbot invented the negative-positive process, which allows multiple prints to be made from one negative. 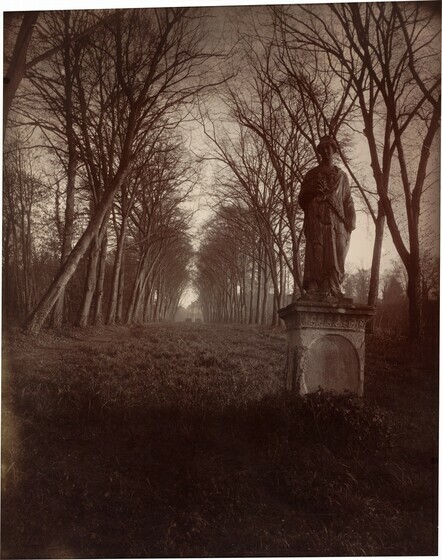 Despite his scientific background, Talbot immediately recognized the artistic possibilities of photography, as this photograph made on a trip to France indicates. 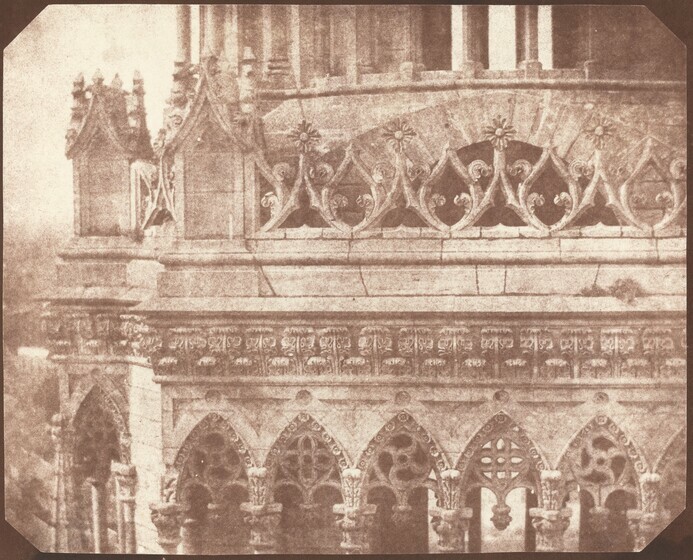 Instead of presenting the entire cathedral, Talbot climbed to the top of one of its towers and took advantage of the camera's ability to frame a detail that was expressive of the larger whole. The photograph merges the delicate stone tracery with the softness characteristic of a salted paper print. Trained as both a lawyer and a painter, Fenton was one of the most influential British photographers of his time. In the last few years of his photographic career, beginning in 1860, Fenton turned his attention to still lifes, a subject that had become popular in mid-nineteenth-century British painting but was new to photography. 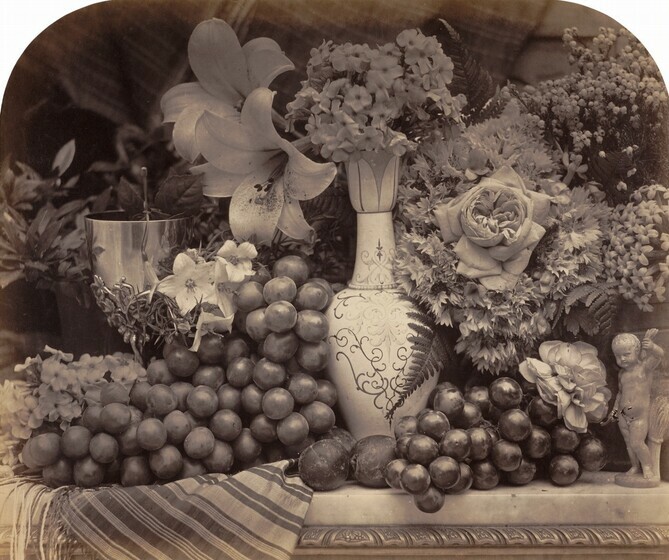 Positioning his camera so that the viewer seems pressed up to the edge of the table, and constructing improbably dense arrangements of painted vases, ripe fruits, and delicate flowers, Fenton created lush and sensuous compositions. One of the most prominent and successful British photographers of the second half of the nineteenth century, Frith specialized in travel photographs of ancient Egypt and the Holy Land that were meant to appeal to British armchair travelers. He made three expeditions from 1856 to 1860 and was among the first photographers in Egypt to use collodion glass negatives, which produced crisp, clear details. 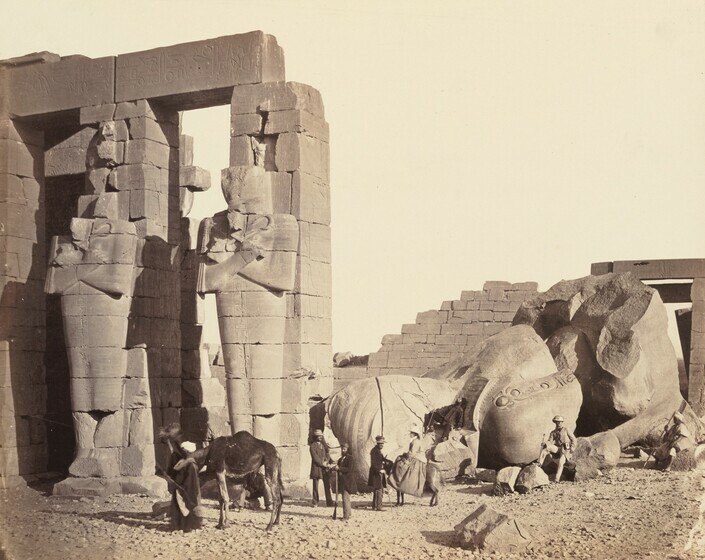 Typical of Frith's images from his first trip, this mammoth-plate photograph depicts the massive walls and statuary of the remains of the Ramesseum, or temple of Rameses II. By including European travelers and their Egyptian guides, the photograph conveys the monumental scale of the ruins and illustrates the contrast of two different cultures. Southworth and Hawes were among the most important American portrait photographers of the nineteenth century. The two men worked together in Boston using the daguerreotype process, a popular way of making portraits in the United States in the 1840s and 1850s. They aimed to capture the "life, the feeling, the mind, the soul" of their subjects. 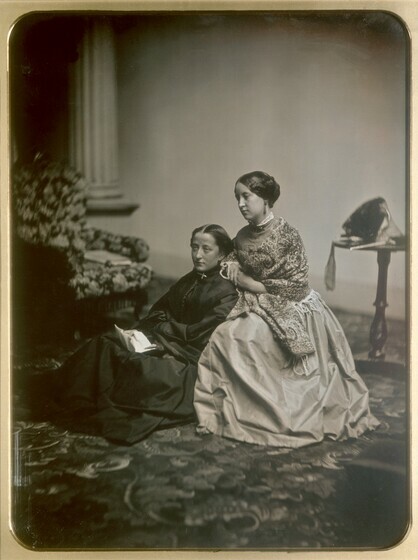 Although the two contemplative women here were carefully posed, The Letter is more natural in feeling than most daguerreotypes of the period, which usually show people in frozen postures and with stern facial expressions because of lengthy exposure times. The informal composition of The Letter also departs from most American daguerreotype portraits, which featured frontal, bust-length, single figures set against a blank or painted backdrop. Southworth and Hawes' innovations enabled them to create an expressive record of human sentiment and friendship. 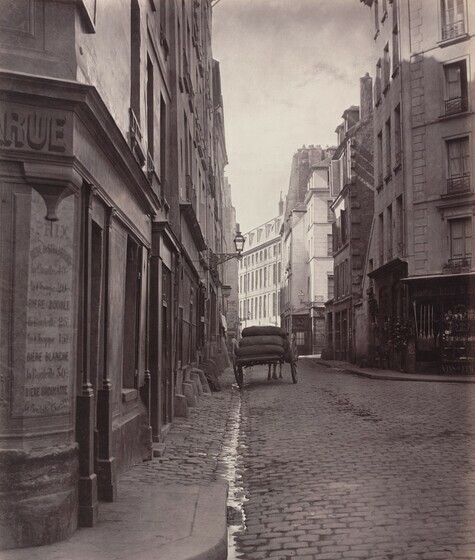 Charles Marville was commissioned to record the streets and buildings that the urban planner Baron Haussmann had slated for imminent destruction in his campaign to modernize the city of Paris. Though made for a documentary purpose, this view of a meandering street in the medieval Latin quarter sensitively captures the light glinting off the water in the gutter, the damp texture of the paving stones, and the play of shadow and light against the building façades. While these picturesque details may charm contemporary viewers nostalgic for a premodern Paris, Haussmann considered them to be evidence of the insalubrious, impractical, and fetid conditions of the old city. Like many other photographers of the time, the French painter-turned-photographer Charles Nègre was fascinated with the problem of photographing the rapidly changing urban environment. 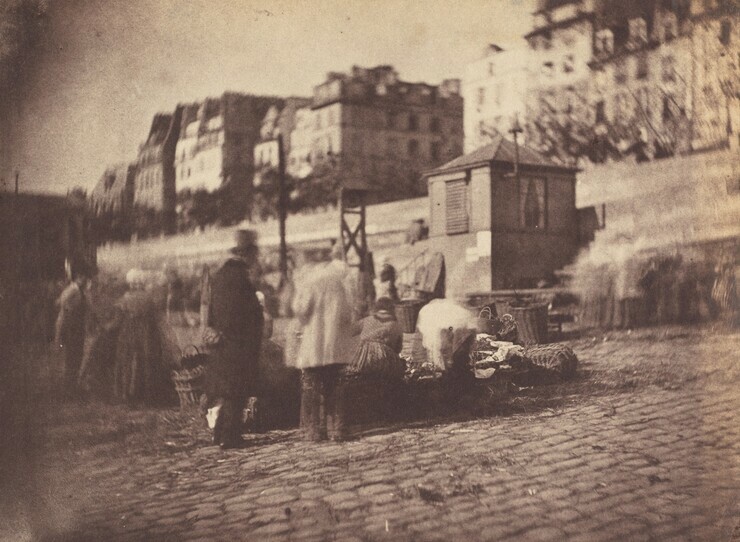 Although exposure times were still long, Nègre developed a lens that enabled him to make photographs that captured movement, as in this unposed market scene. One critic declared that "Nègre's lens is as fast as movement....This is life itself, and Nègre has stopped it with a marvel." From the late 1890s, when he began to photograph, until his death, Atget made thousands of photographs of Paris and its environs. Employing a cumbersome, tripod-mounted view camera, he recorded the myriad facets of urban life at the turn of the century. Modestly billing his photographs as "pictorial documents," he sought neither fame nor fortune. He made a series of photographs at this royal park near Paris, which had been constructed for Louis XIV in the seventeenth century. By 1923, when the park entered public hands, almost all its famous sculptures had fallen prey to the ravages of time and neglect. With its melancholy lighting and focus on the single statue as the lonely remnant of a glorious age, the photograph is a poignant reminder of the fleeting nature of human achievement. During World War I, Coburn became part of a group of English artists known as the Vorticists, who rejected the sentimentality of nineteenth-century painting and instead emphasized energy and the machine. The first English movement to embrace abstraction, vorticism grew out of cubism and emphasized dynamic, whirling motion, as the name (from vortex) suggests. 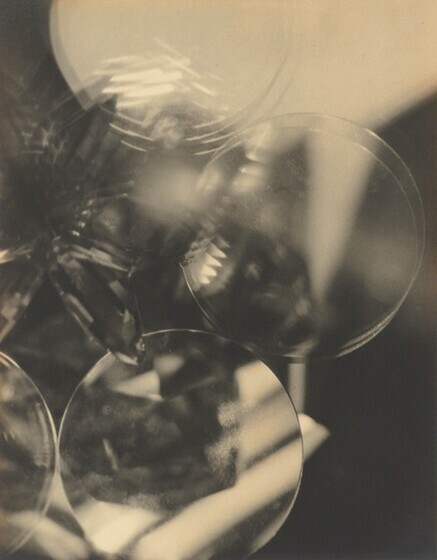 Coburn made a series of abstract photographs he titled Vortographs. 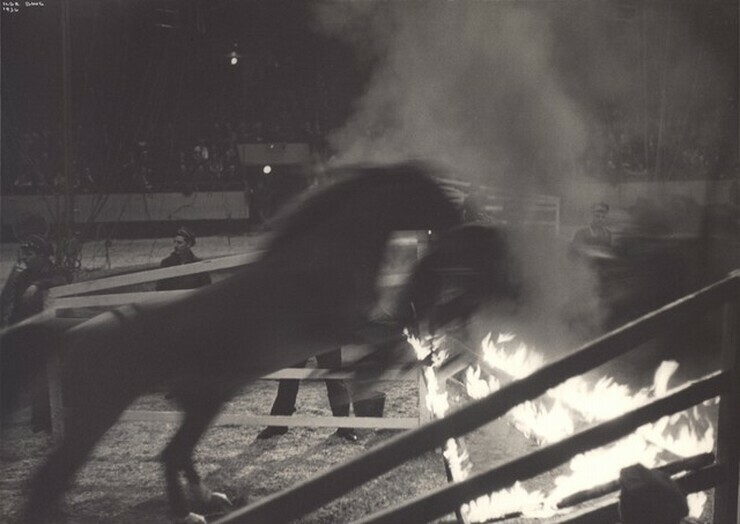 He abruptly abandoned photography soon thereafter and devoted himself to mysticism. 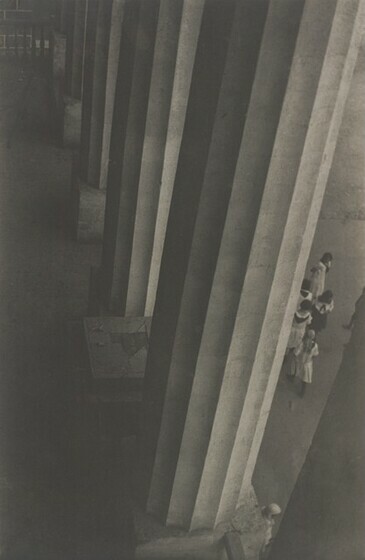 In 1916 Gilpin enrolled at the Clarence H. White School of Photography in New York. Two years later, she returned to her native Colorado Springs and became one of the few women to pursue landscape photography. 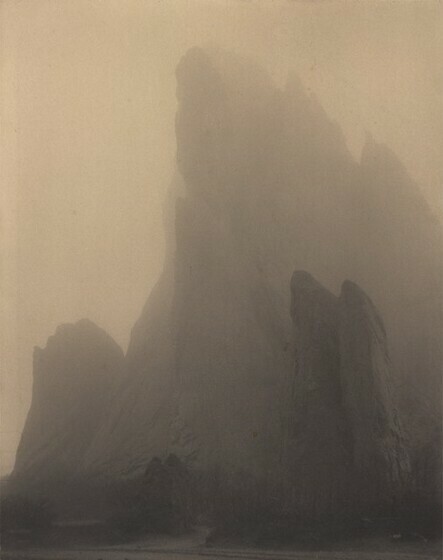 Her depiction of the Garden of the Gods, a scenic rock formation in Colorado Springs, captures the stillness and otherworldly quality of the area and reflects the emphasis Clarence White placed on the evocation of mood rather than on descriptive detail. The Dutch-born American Johan Hagemeyer studied photography under Edward Weston, who quickly became a close and influential friend. Hagemeyer, a staunch pictorialist and aesthete, emphasized mood through his use of soft focus and dramatic contrasts of rich blacks and shimmering whites. Arndt studied weaving and textile design at the Bauhaus, the celebrated school of art and design that had moved to Dessau from Weimar in 1925. While there, she taught herself photography and made innovative self-portraits, using costumes and props to adopt a series of guises—including, here, the vibrant and emancipated character of the "New Woman" so popular in her time. In 1925 Rodchenko bought two small, lightweight, handheld cameras, which were precursors to the 35mm Leica. As he used them, he realized that earlier cameras, which required a tripod or had to be held at the waist, had limited photography to traditional ways of depicting the world. The new hand cameras freed him to roam the streets of Moscow and explore radically new points of view. 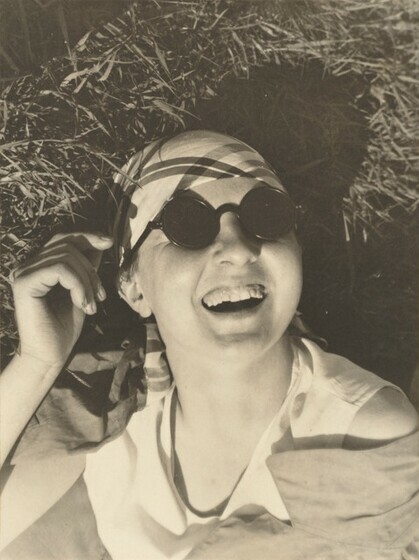 Thereafter, the use of oblique angles became a cornerstone of Rodchenko's photography. Brandt grew up in Germany and Switzerland and established a career in London as a photojournalist in the emerging market of pictorial magazines. 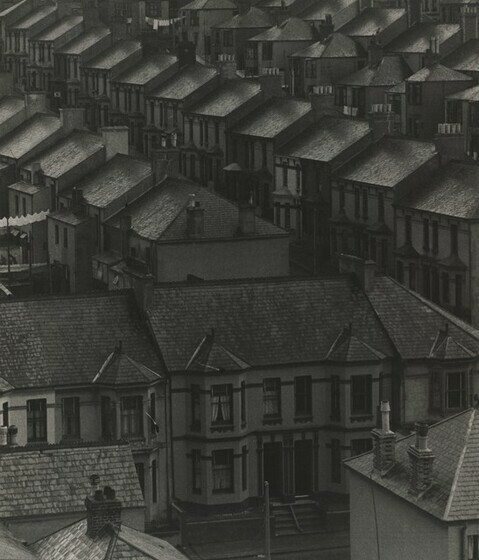 The terraced roofs of the city's row houses fill the frame of this photograph with their geometric regularity, conveying the overwhelming density and sameness of London's middle-class housing. This image was part of Brandt's larger study of the social contrasts within British society. 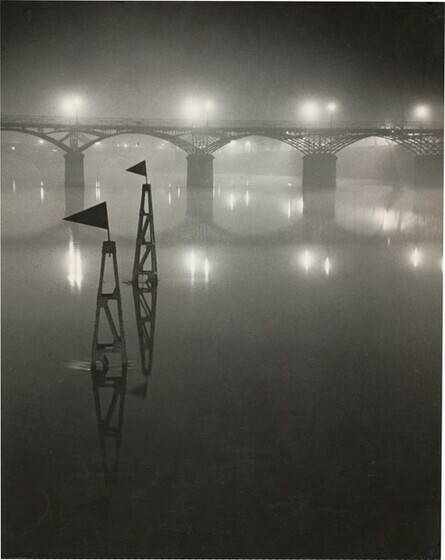 When Brassaï began to photograph in the late 1920s, the city of Paris was in the process of converting from gas to electrical lighting. Buildings, monuments, bridges, and even the river Seine, which had appeared nondescript in daylight, took on a dramatic, often eerie prominence when radiantly lit at night. 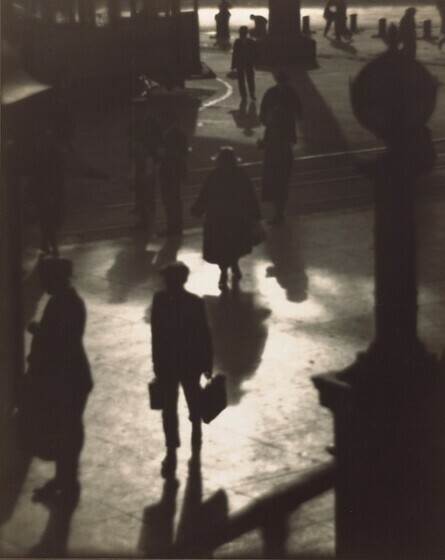 Brassaï used the dazzling effects of artificial light to construct haunting pictures of the nocturnal city. Like many early twentieth-century photographers, Ilse Bing began her career supplying photo essays to the burgeoning illustrated magazine business in the late 1920s. In 1929, Bing left her native Frankfurt to join the vibrant artistic community of interwar Paris. During the following decade she made dazzling images of urban life in Paris and New York, covering events such as street fairs, the ballet, and the circus, as seen in this photograph taken in the summer of 1936. Bing worked exclusively with the 35mm Leica camera, which arrived on the market in 1925 and was quickly adopted by photojournalists. Whereas earlier equipment had been bulky and taken time to set up, the portability and short exposure time of the tiny Leica made it the first camera suitable for candid, hand-held work. Bing used its small size and high speed to her advantage and became known for her ability to get close to the action, often employing dramatic available light and slanted angles to capture the dynamic, poetic energy of her subjects.